In a stunning announcement today, the United States Mint said it will not offer 2009 Proof Silver Eagles nor 2009-W Uncirculated Silver Eagle coins. The news is a bitter pill to swallow for some collectors who will now forever see a hole in their Silver Eagle collection which dates back to 1986. The US Mint decision, however disappointing, is not entirely surprising given the enormous demand of the bullion versions — those eagles just broke an all-time annual record and are near 21 million in sales. That demand was cited in today’s US Mint media statement, which included notice of other cancellations, like the proof and uncirculated American Gold Eagles. "Because of unprecedented demand for American Eagle Gold and Silver Bullion Coins, the United States Mint suspended production of 2009 proof and uncirculated versions of these coins. All available 22-karat gold and silver bullion blanks are being allocated to the American Eagle Gold and American Eagle Silver Bullion Coin Programs, as mandated by Public Law 99-185 and Public Law 99-61, respectively. Both laws direct the agency to produce these coins in quantities sufficient to meet public demand. 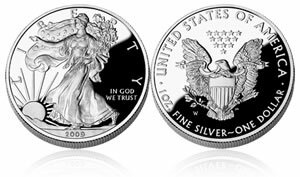 The proof and uncirculated versions of the American Eagle Gold and Silver Proof Coins are not mandated by law." "Once sufficient inventories of silver bullion blanks can be acquired to meet market demand for all three American Eagle Silver Coin products"
That obviously did not happen and collectors likely look warily upon 2010 production with the US Mint today also saying that it would work "diligently with current and potential blank suppliers to increase the supply of bullion coin blanks" in order to offer the coins in 2010 — a message that has not changed much in nearly 1 1/2 years. With the latest news, premiums are likely to go up for earlier year coins. Prices are on the secondary market are not insignificant already, as samples of 2008-dated coin auctions from eBay show. The design for silver eagles is based on A.A. Weinman’s "Walking Liberty" first introduced on the 1917 silver half-dollar. Many collectors today consider this design to be one of the most beautiful ever minted. The silver dollar features Weinman’s “Liberty” in a flowing gown draped in the American Flag. Her right arm is stretching towards a rising sun while her left arm holds an olive branch of peace. ‘Liberty’ and ‘In God We Trust’ are inscribed around the mythical figure and the date is seen as well. The reverse is from engraver John Mercanti who created the Heraldic Eagle with shield, meant to symbolize strength and endurance. In the eagle’s beak is a strip with the inscription ‘E Pluribus Unum’ with ‘United States of America’, ‘1 oz. Fine Silver’ and ‘1 Dollar’ surrounding the bird. i read that the public can not buy unc/ proof coins. Who is all the bullion sold to? how does the average Joe buy these coins? The average Joe gets the bullion versions through coin dealers/resellers who purchased the coins from the US Mint’s authorized purchasers. Most people buy the coins from their favorite local dealer, pawn shop, online, eBay, etc., etc.